On the Green in the village of Thorpe Market stands an impressive late Elizabethan house that was originally the farmhouse of Green Farm. In recent years it was run as a restaurant but has now been converted into a luxury bed and breakfast establishment. 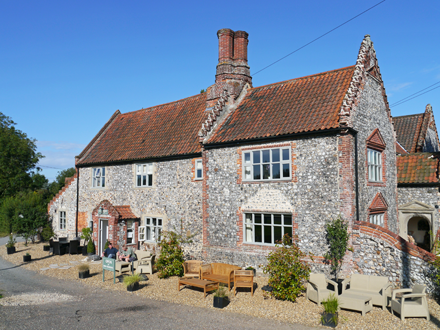 it is ideally situated for exploring the North Norfolk coast. The Norfolk Broads are also within a short drive and the lovely city of Norwich is only 20 miles away. This beautiful building has been carefully restored by the present owners and has been equipped to a very high standard. There are four bedrooms from which to choose; all are doubles. Each is en suite with a walk-in shower. One of the rooms has a double-ended bath. 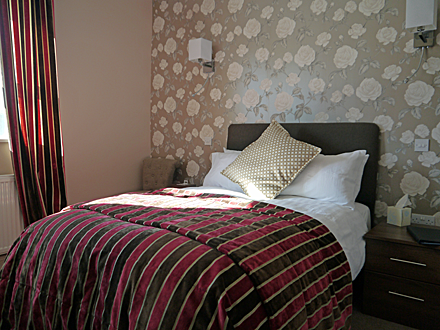 All the usual facilities that are expected in a high-quality B&B are present. The house has a large reception area, breakfast room and a comfortable lounge. The licensed bar is open to non residents and light lunches are served. 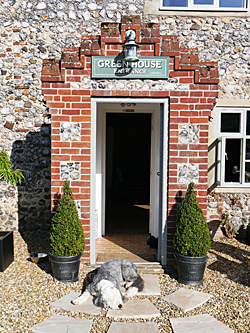 Guests can also enjoy an evening meal at Green House if required. Note: as Green House is licensed premises children under 14 years cannot be accommodated. The nearest railway station is at Gunton, which is just 1.1 miles away. This station is on the picturesque Sheringham to Norwich ‘Bittern Line’. Guests can be collected from the station if required. A bus stop is opposite the house. There are direct services to Cromer and North Walsham. Stansted Airport is approximately 70 miles away. Just 12 miles away is Norwich International Airport. A truly special place to stay. Accommodation excellent, all meals a dining experiance. Wonderful hosts who offer a warm welcome and ensure your stay is unique. A very homely atmosphere. Will certainly be going back. My pleasure. I hope it is a great success. I just wanted to say a huge thank you for the kind words on your blog about the house! Thank you! A wonderful picture of Millie dog lazing in the sun, what a picture she poses!